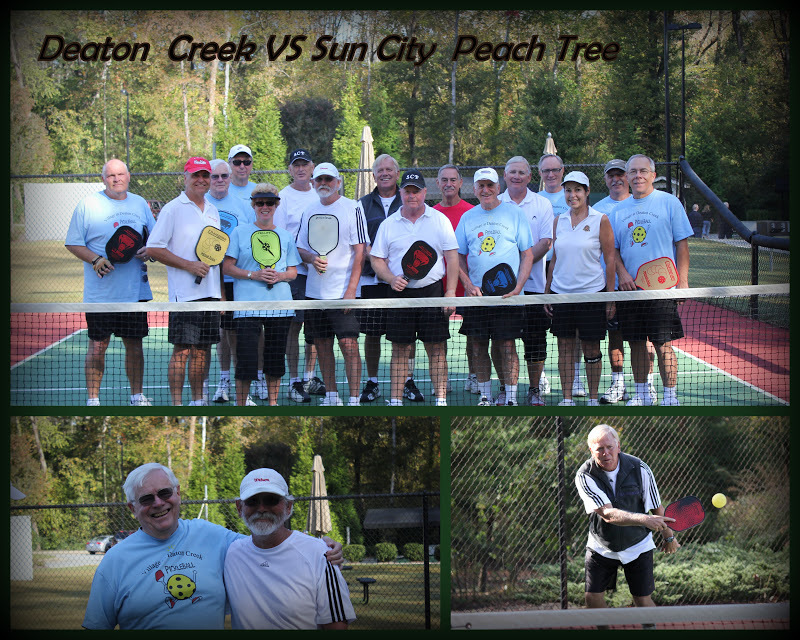 ( Jodi spends her summers in GA and her winters in FL........this was the final pickleball event before she came south! Third time proved to be a charm...after 2 rain outs(one in the spring & one in the summer) fall proved to be the perfect time for the Del Webb communities of Village of Deaton Creek & Sun City Peachtree to have a face off. On Tuesday, October 23rd at 10:30 am, the top teams teams of both communities competed at VDC. The weather was glorious with plenty of sunshine and a comfortable 74 degrees. The teams played a full 16 game round robin with each team playing every other team, followed by pizza lunch in the downstairs clubroom at the VDC clubhouse. It was great that these two Del Webb communities finally got their match in!